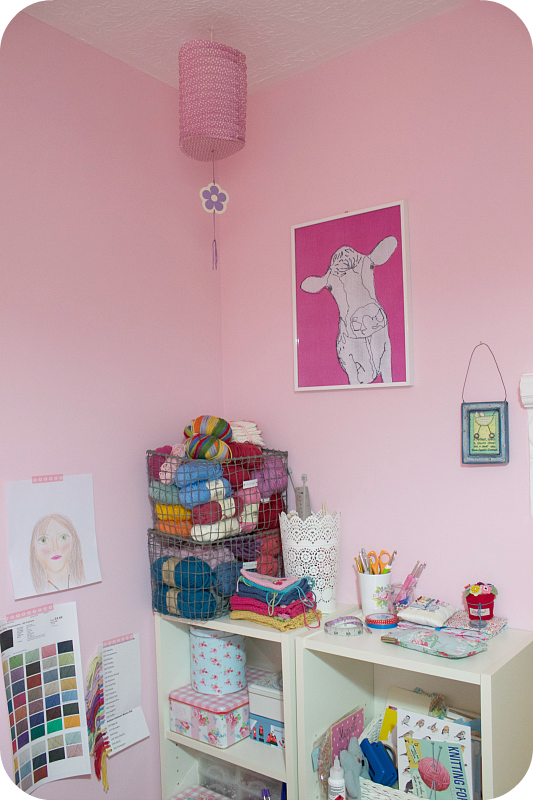 I wondered if you fancied a little potter around my craft room? It's definitely an 'in day' today as the weather's been so grotty and I've just been giving it a bit of a spruce. The kettle is on and you're most welcome. I love my craft room. I wish I'd given it a more interesting name from the offset. My friend Cuckoo calls hers 'the bird box' which is delightful but if I called mine anything else now it would be too contrived so 'craft room' it is. 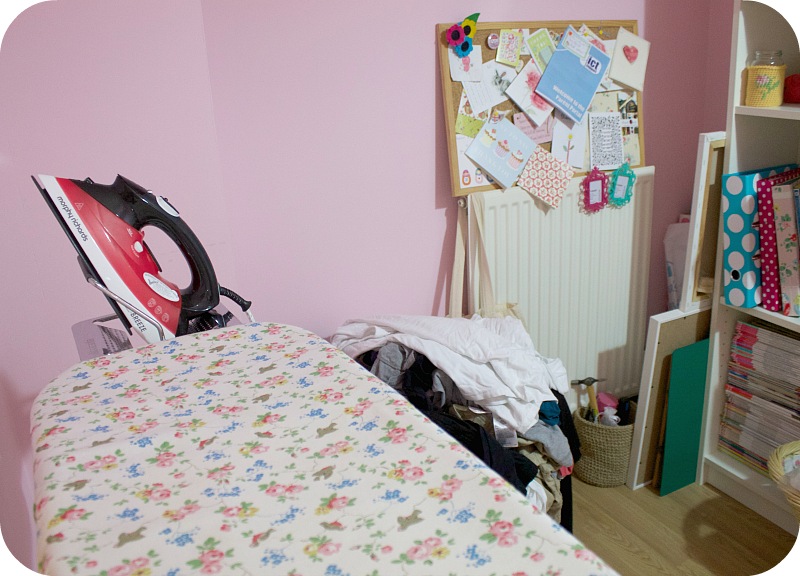 I claimed this room as my very own eighteen months ago and blogged about it here. Gosh, it looks so much more cluttered now. It's definitely a hotchpotch and not the kind of room you'd ever see gracing the pages of a magazine but it's full of my pretty treasures and favourite things. It even smells nice. Occasionally I get an urge to have a ruthless purge and turn it into something a little more streamlined and stylish but it doesn't last long. Anyway, I don't think there is one single thing in here I could, or would want to, do without. It's extremely dull today so please forgive the lighting. Unfortunately I do have to share it with the ironing board. And Mount Ironing. There's no point in my pretending that the shameful heap you see there is a one-off; there will be clothes at the bottom of the basket I've actually forgotten I own, trust me. The pin board hasn't quite made it up on to the wall yet. If you've ever sent me a pretty card at some point, you might just see it on there. 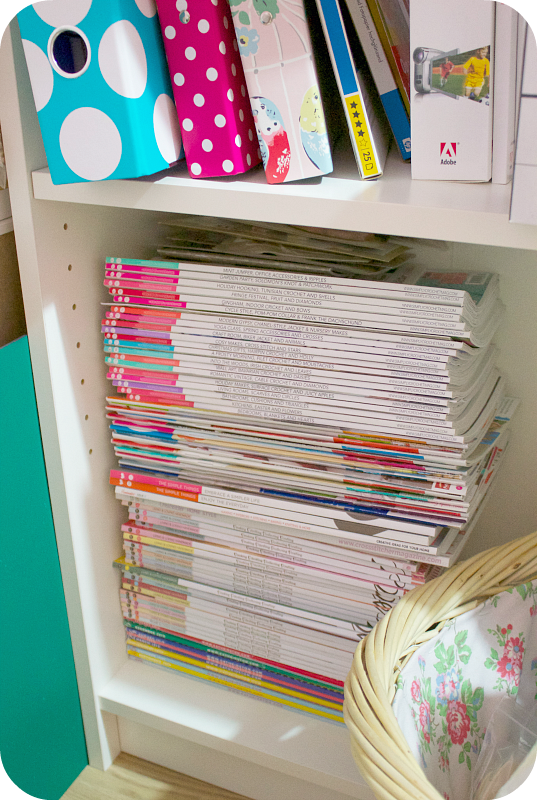 My pile of magazines. Mostly Mollie Makes, Simply Crochet and Cross Stitcher. I don't subscribe to any magazine any more and only very rarely do I buy one. I feel I've amassed a bit of a reference library and can spend ages just picking through them. As for the files? I file everything; it's one of my 'things'. I think it stems from my days as a PA. Essential yarn storage! I wonder if there is anyone, anywhere who doesn't have at least one Ikea bookcase??? It may look a bit of a piggy mess to you but I assure you it is organised. At the top there you see my beloved Sublime stash, a wire basket of aran weight yarn and another of Rooster on the middle shelf, and my Debbie Bliss baby cashmerino collection on the bottom. 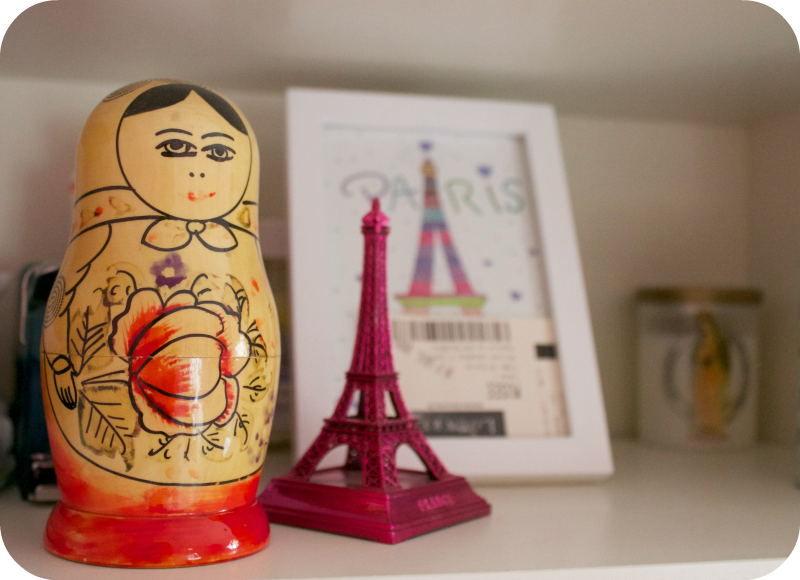 On the very top shelf, I have an original matryoshka doll. My grandmother brought it back from Moscow as a gift, over thirty years ago. Also, a couple of mementoes from my 40th birthday trip to Paris, including an entrance ticket to The Louvre and a candle from Notre Dame. I'm not sure why I keep them all hiding up here. Katie Daisy calendar. I must check if there is to be a 2015 version. This is a little bedside table that used to belong to my Mother In Law. One day I will paint it. A soft turquoise I think. The drawers are chock-full of felt. My poor neglected sewing machine sits on top. It's a Brother XL-4023. I bought it years ago from a mail order catalogue, paying in instalments, and, despite its ill-treatment, it's never let me down. Oops, I think it needs a wipe! 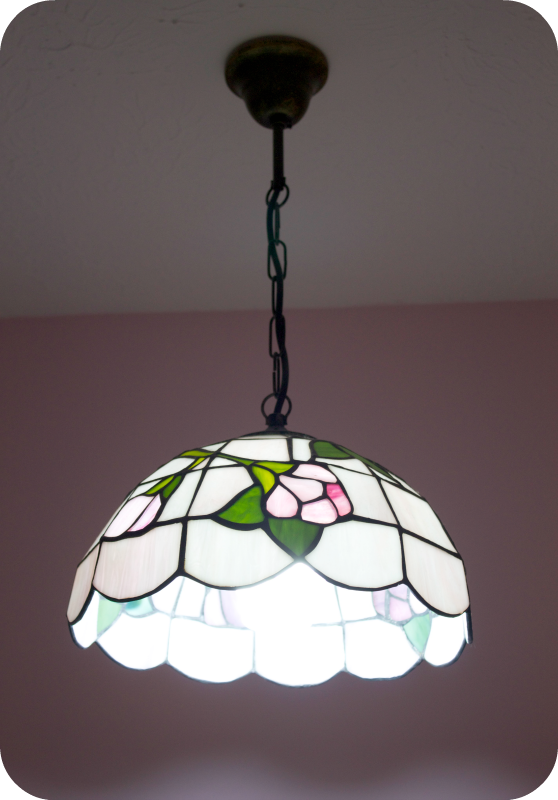 Random pretties hanging from the ceiling. My 'control centre' from a very unflattering angle. Shredder (what can I say, I worry about fraud! ), bin, 'phone, printer, radio and laptop. All within easy reach. All extremely essential. This is where I sit and blog. My 'desk' is actually our old Habitat kitchen table and, after years of being smeared with vegetable puree and Weetabix, glue and paint, I like to think it's enjoying its sedentary retirement in my craft room. 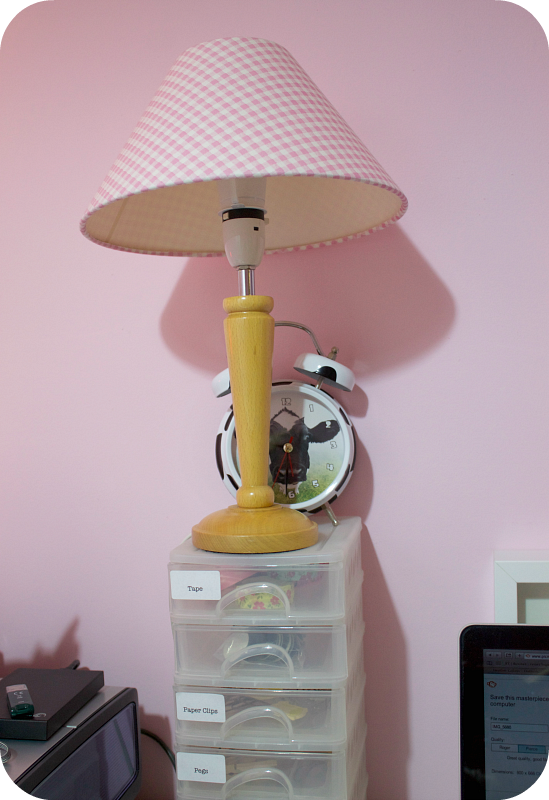 A Laura Ashley lamp my daughter didn't want anymore and, likewise, a cow alarm clock from my son. One of my many gorgeous Janet Bell prints. 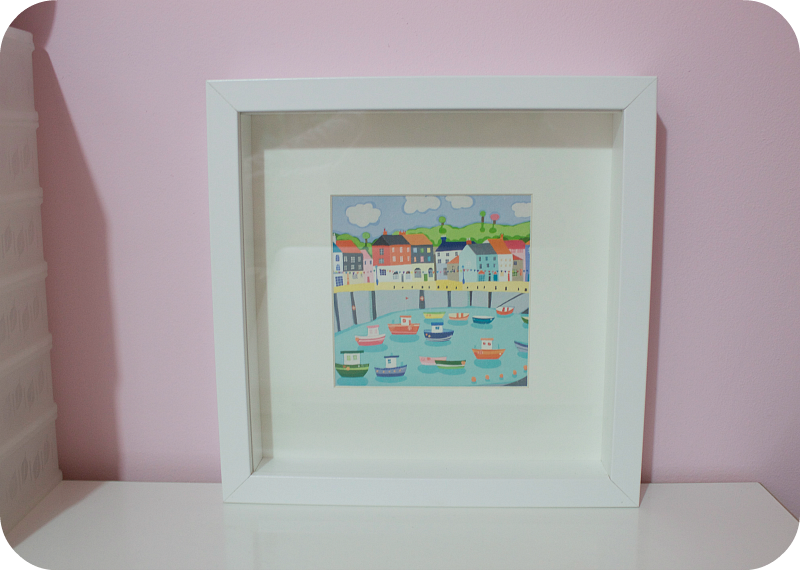 I particularly love this one because it reminds me of Mevagissey. I'm going to hang it above the table, so it's directly in my eyeline. One day. Ahem. More shelves. More yarn. Drops in the bottom basket and a random selection in the top. 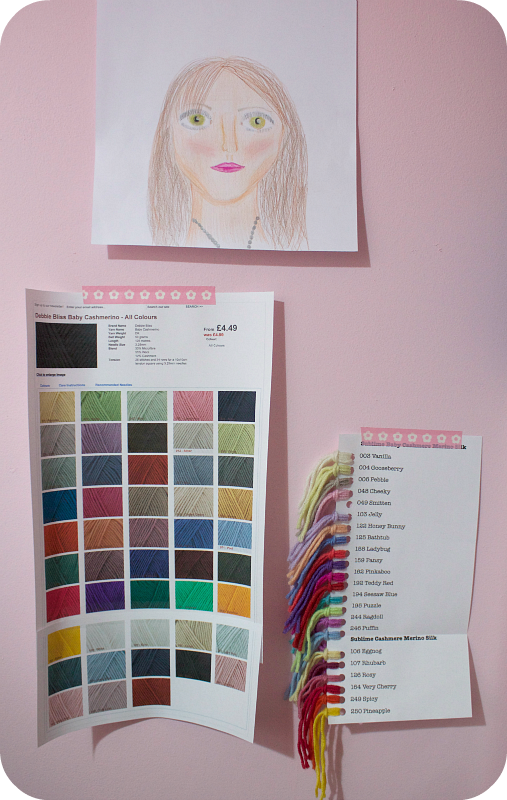 I often print out yarn colour charts - they're such a useful quick reference. It makes reordering (too) easy plus, of course, they're nice to look at! To its right is a selection of discontinued Sublime colours. I'm often asked which yarn I used for past projects and, without this, I'm sure I wouldn't remember. Bertie loves it when I'm in my craft room. He lies just over the border into the lounge where he can keep close tabs on me. Today he seems to have collected a motley pile of toys. Bless him, do you think perhaps he wants to show you some of his favourite things too? If I've inspired you to share your crafty corner (go on, please do), simply add a link at the bottom of this post (under the comments box). Thank you so much for visiting. Do come again soon. 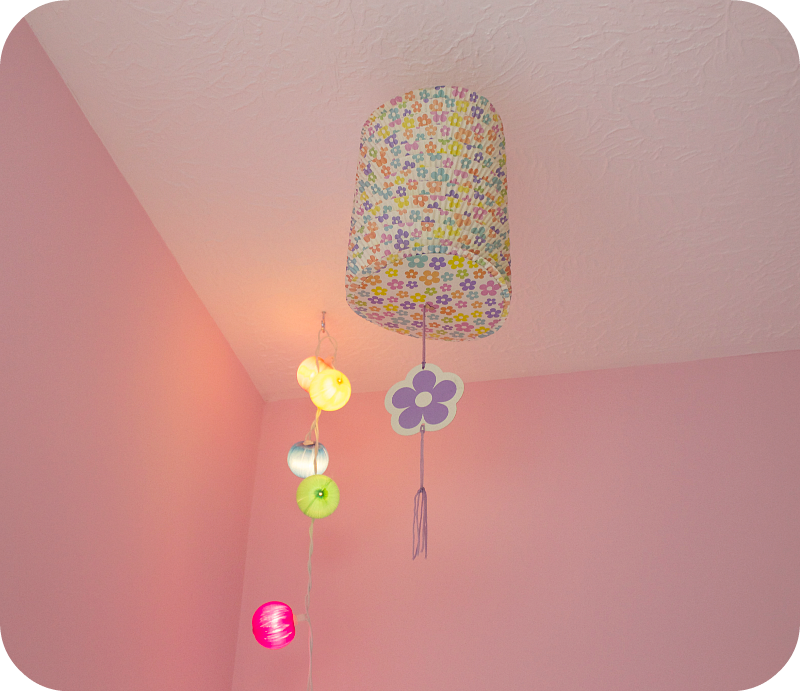 Dinki Dot's pretty craft shelf (love the colour). Silvia's genius yarn storage idea. Your craft room is lovely. Mine gets called the dragens den. Now the weather has turned though I am back in the cottage in the warm and only pop into the dragons den when I am in search of something. It will be back in full use come the spring though. And I'm in love with Bertie !!! That sweet look on his face.. "Please show my stuff too...". Soooo sweet :-) ! 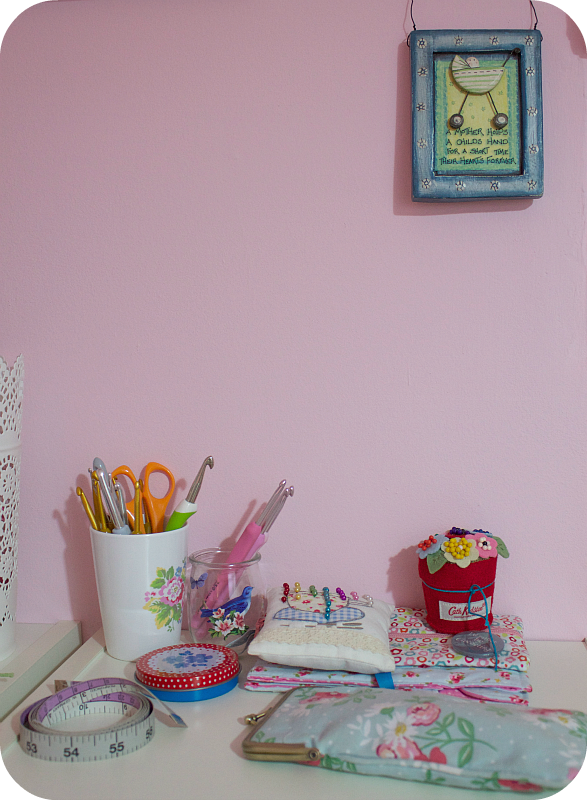 What a pretty and organised craft room Heather! What would we do without good old Ikea bookshelves! Love all your pretty yarn on show - mine is just stuffed away in bags and baskets as there is no room in my craft room as its chocka full of fabric. I wouldn't dare share mine at the moment as its a total mess, and the floor is scattered with fabric offcuts and thread! But yours is lovely, and thanks for sharing. 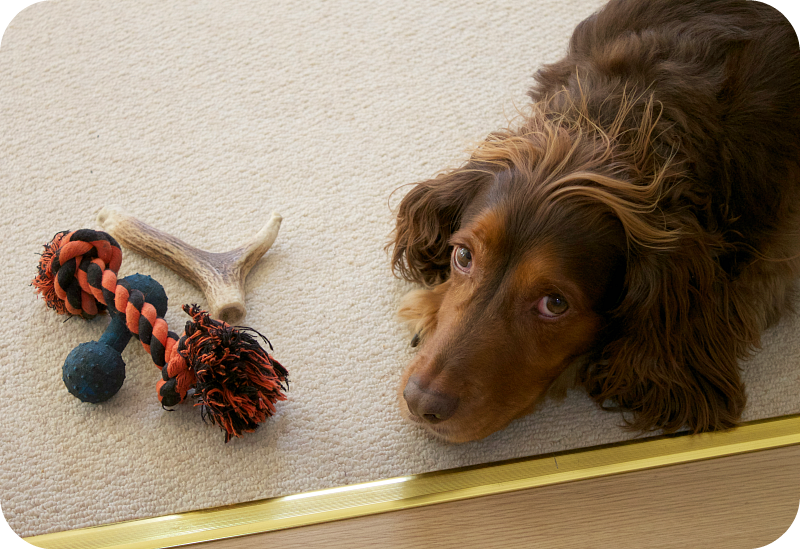 Bertie looks adorable and so cute showing off his toys! Hi Heather, lovely to see your craft space. It's very pretty and very you. I looked up this years Katie Daisy calendar and it's got lots of repeats of this year...so disappointing. I've loved this years version all year. Lovely!!!! Looks like a fun place to be in!!! Love all the little bits and bobs!!!! It's the little things that "make" it the space it is, don't you think? Have a happy weekend!!! 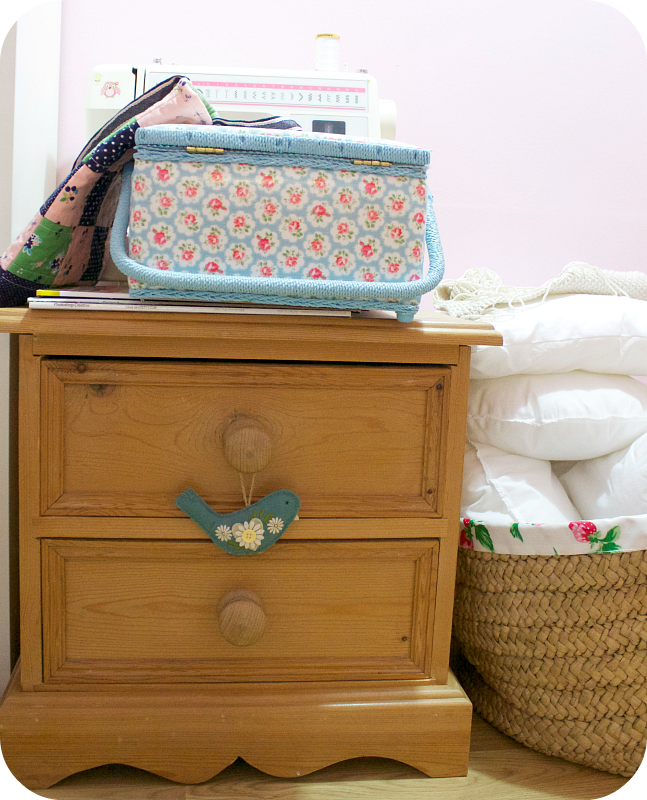 I LOVE looking round other people's craft room, thankyou so much for sharing all your lovely things :) I have a similar space, what was our spare bedroom, it's quite a recent thing and very cluttered, but I'm trying to sort it out a bit at a time. I think that that's almost as satisfying as the craft itself! Thanks for the beautiful pictures, so many lovely things! What a wonderful room, and full of so many delicious things. I love the bits from the children. Bertie is such a sweetie, very photogenic. No craft room here to show you unfortunately, just the odd shelf and a bit of the wardrobe. I dream of rooms such as yours. 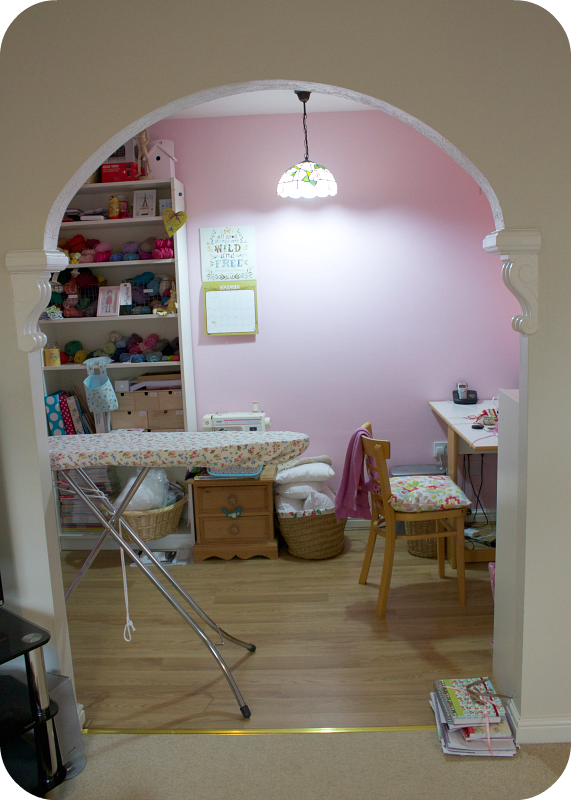 Oh Heather, I ♥ your craft room too ! I love your craft room ... 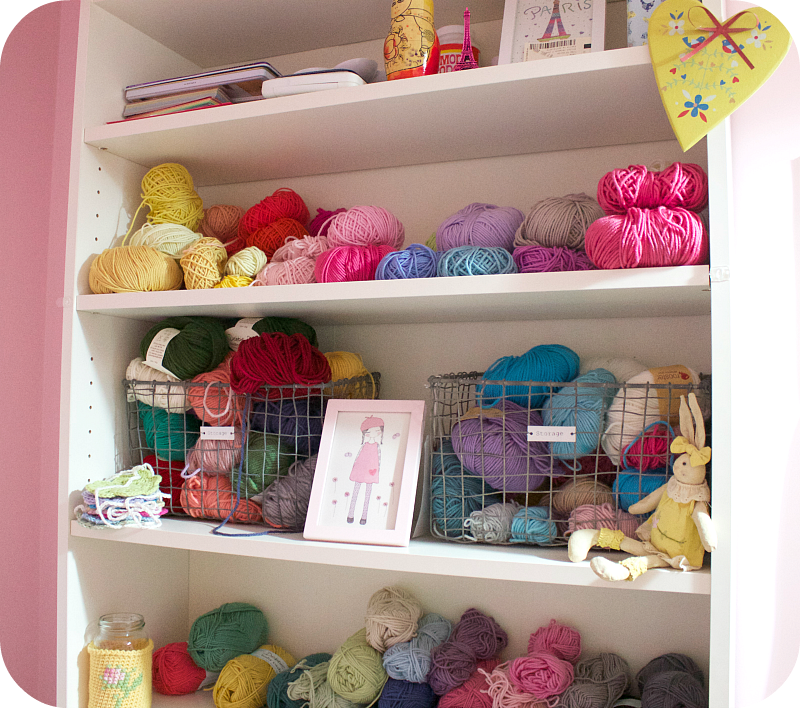 Especially all the gorgeous yarn storage! 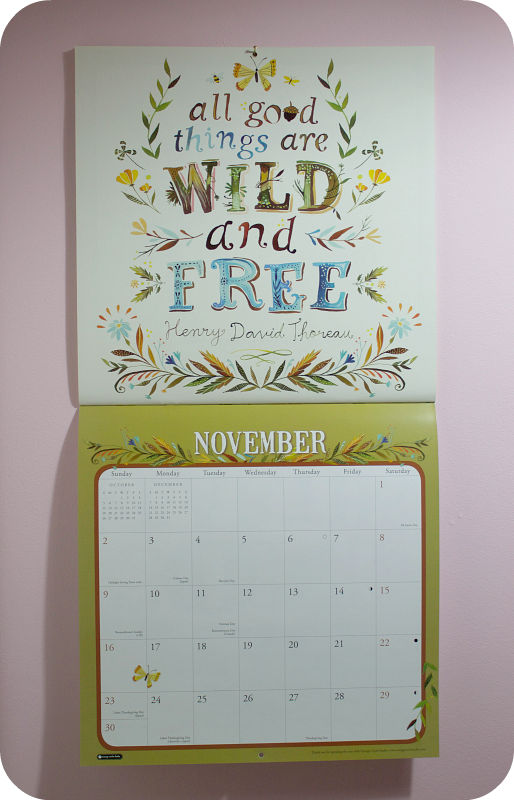 I love the pink walls (sighing longingly!). Mine tends to double as the clothing distribution centre in our house!! 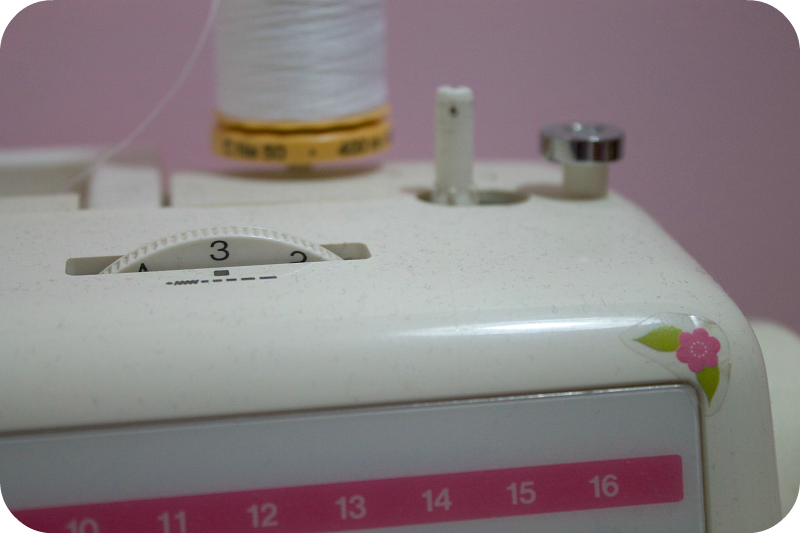 Thank you for letting us visit your craft room ~ it is lovely, and so warm and welcoming. I, like you, have always enjoyed peering into people's homes when the lights are on and the curtains pulled open! Fortunately now we can view craft rooms this way! 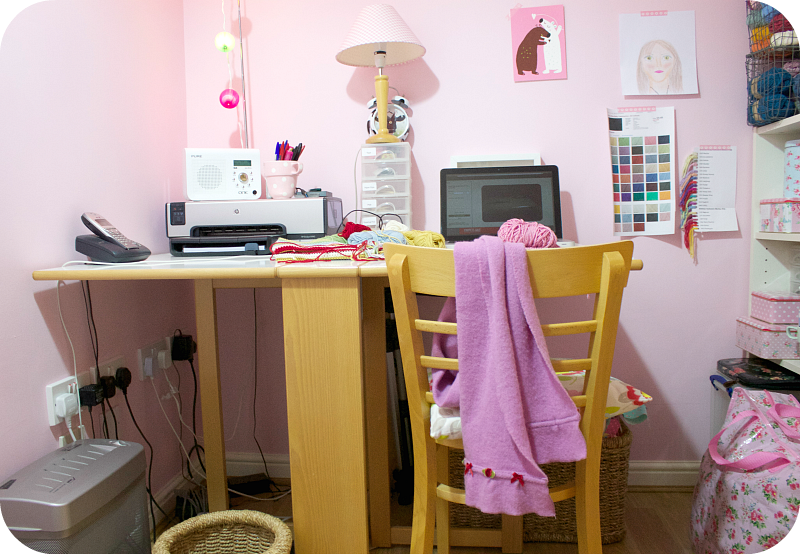 How pretty and inviting your craft room is! I love that shade of pink, and all your lovely storage and pretties. Thank you for showing us, Heather. It's lovely and yes I certainly did enjoy my little look around. Just the sort of tour I like, poking into all the corners, perfect! 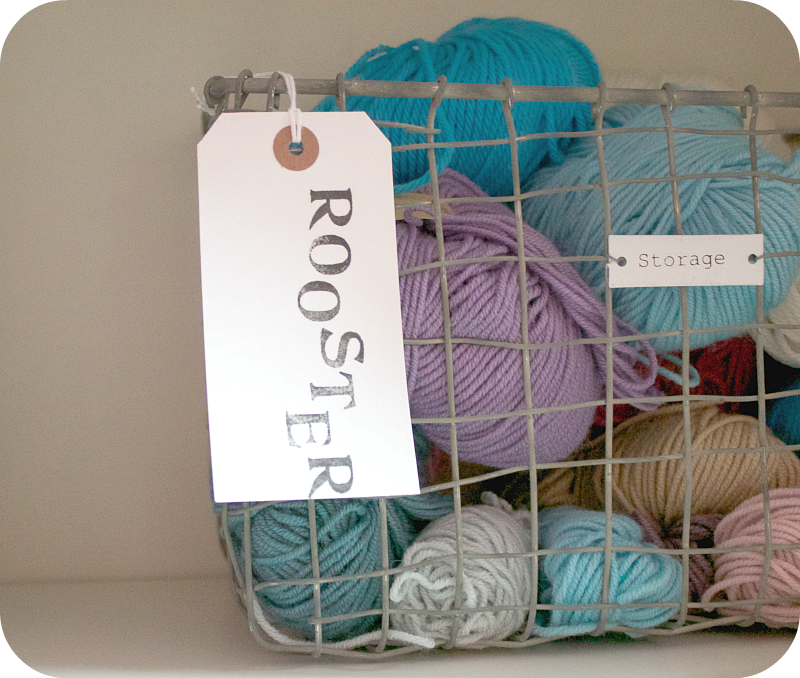 Love your wire storage baskets for yarn, so pretty! PS You keep yarn in the open air, you're braver than me ... the only time I risked that we had a moth incident!